Boulder City businesses and residents won’t have to pay higher utility rates until the fall as City Council approved delaying an increase originally planned for the summer. 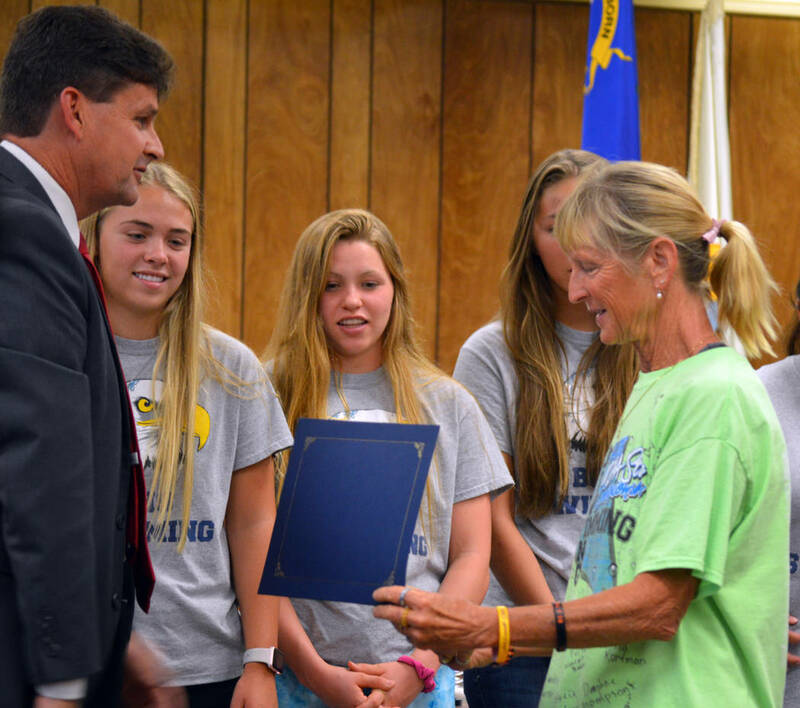 Celia Shortt Goodyear/Boulder City Review Mayor Rod Woodbury presents Boulder City High School Swim Coach Sara Carroll with a certificate of achievement at the City Council meeting Tuesday for the girls team's recent state title, its sixth consecutive championship. Celia Shortt Goodyear/Boulder City Review Mayor Rod Woodbury discusses the recent state championship wins by the Boulder City High School girls swim team and boys golf team at Tuesday's City Council meeting. The increase was scheduled to go into effect July 1, but council members approved delaying it during their regular meeting Tuesday, June 12. The item was part of the consent agenda so there was no discussion. Finance Director Diane Pelletier said the 90-day moratorium is on all the utility rates: water, sewer and electric. 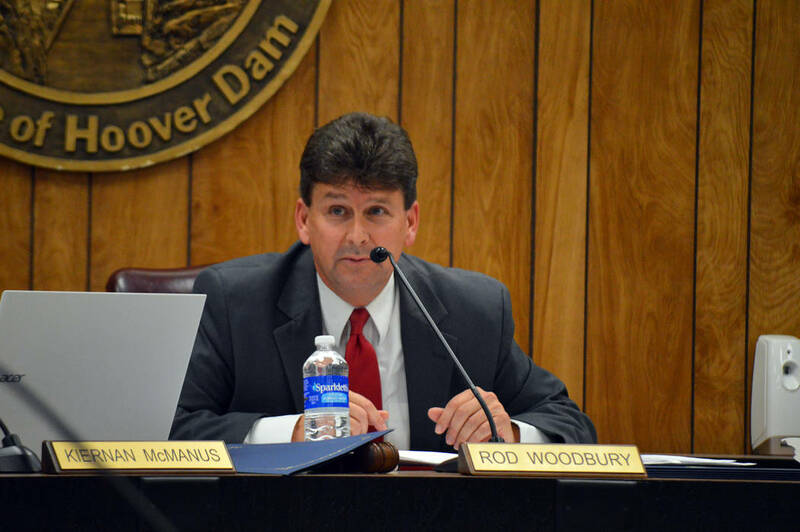 The 2018-2019 fiscal year budget approved by the council May 22 took into account this moratorium. At a March 15 budget workshop, Public Works Director Scott Hansen said deferring the rate increase was based on community feedback as last year’s increase came when temperatures soared, causing usage to rise. Many residents were shocked at their higher utility costs. ■ Heard a report from Leslie Woodbury, museum development officer, about past and upcoming events at the Boulder City/Hoover Dam Museum and Boulder Dam Hotel. ■ Approved TAB Contractors Inc.’s $1.6 million bid for the Eldorado Valley waterline extension. The company’s bid was lowest of the 13 received. ■ Approved Muller Construction’s bid of $219,529 for the addition to the Municipal Court. This bid was the lowest. ■ Presented certificates of achievement to the Boulder City High School girls swim team and boys golf team for their recent state championship titles. ■ Introduced a bill for a new ordinance that would provide a joint-use land agreement for the Nevada State Railroad Museum expansion between Boulder City and the Nevada Division of State Lands. ■ Presented a certificates of award to the St. Andrew’s Council, Knights of Columbus, youth contest winners. ■ Received a $11,000 donation from the Boulder City Sunrise Rotary to the Boulder City Municipal Court for the Breaking the Cycle drug court program. The amount included a $1,000 donation from a construction company.